The Canmore Miners’ Union Hall, completed in 1913, remains one of Canmore’s most important cultural facilities. Today, over 100 years later the Union Hall continues to serve the community as a venue for meetings, social events, such as weddings, fundraisers, plays & concerts, and it is fitting that the Union Hall, built by volunteers and now owned by the Town of Canmore, continues to be operated and maintained by volunteers. The Union Hall is also an important part of Canmore’s built heritage as the sole public building that dates back to Canmore’s earliest days. Coal miners built the Canmore Miners’ Union Hall, volunteering their time and expertise to construct a meeting hall and office for their union, which was formed in 1905 as Local Union 1387 of District 18 of United Mine Workers of America. Canmore’s miners began meeting in secret in 1903 at the base of the hoodoos — well away from the mine workings — as a move to improve safety, working conditions and wages. By 1903, coal miners working for the H.W. McNeill Co., which operated the mines for the Canadian Anthracite Coal Co., were only receiving $1.25 for 12 hours of work. They also faced some of the most difficult mining conditions in the Northwest Territories (Alberta did not become a province until 1905) that included steep, gas-filled seams of coal that led to a massive explosion in 1901 that killed eight miners. 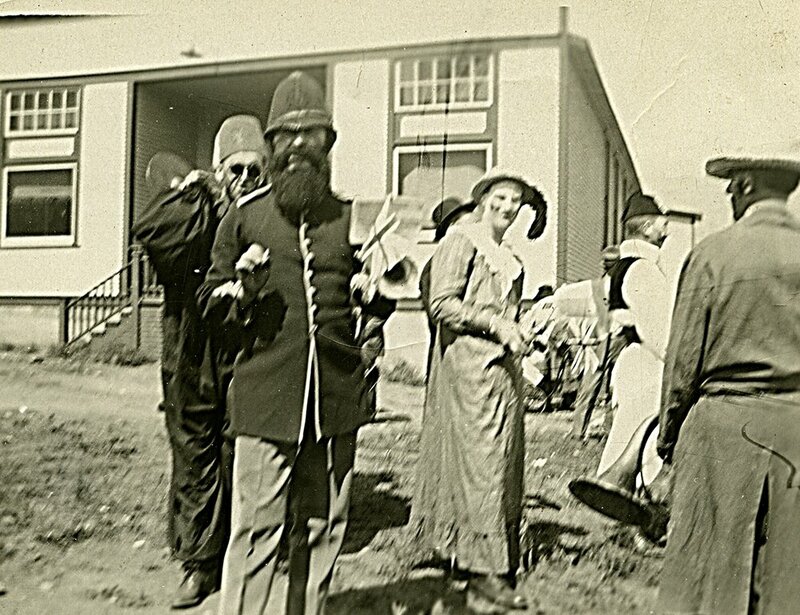 Led by Pete Paterson, the first District 18 president, the union held its first meetings in the Finn Hall, which stood in a Finnish neighbourhood on Mineside near Whiteman’s Creek (now Canmore Creek). During a strike in 1907, the mine owners evicted the union from the privately-owned mine land. The Union executive – Steven Kalina, president, Mike Warren, recording secretary and Nicholas D. Thachuk, treasurer – instead began to meet in a shack, owned by a man named Housenburger, near the railway station, until the Union Hall, begun in 1910, was completed in 1913. Part way through construction, on March 1, 1912, the union signed a lease with the Dept. of Interior the year before on March 1, 1912 for lots 9, 10, and block 63. After construction was complete, the hall and the two lots it sits on had an assessed value of $5,000. By 1918, the value of the Union Hall was assessed at of $5,000, with taxes of $88.40. A year later, the value of the building and the land had dropped to $4,200, but taxes, however, rose. The Union paid $96 that year and by 1920, paid $105. 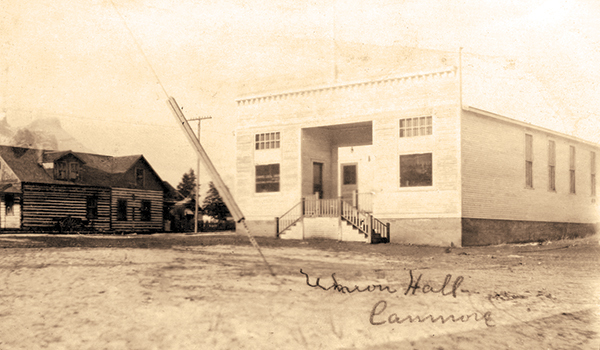 After it opened, the Canmore Miners’ Union Hall became a community centre as well as meeting space for the union, eventually replacing the Canmore Opera House as a place for entertainment, such as dances, movies, plays and celebrations. In 1936, the school board began holding its meetings in the hall, as well. In the spring of 1920, electrician R.O. Davis prepared a quote for the union executive to wire the hall for electricity and install 40 lights and 11 snap switches, four of which were two way switches. Davis quoted a price of $231 for the work, but it is not known if the job was done that same year. According to Edna Appleby in Canmore: The Story of an Era, the first building to have power on Townside (the north side of the Bow River, while everything on the south side was known as Mineside) – was the Canmore school, built in 1922. After the mines closed in 1979, the Union Hall fell into disrepair and in the early 1980s, the municipality considered demolishing the building to create a parking lot – this was before three houses that faced Seventh Street and a barbershop, located along the alley, were demolished to create parking. Instead, Pine Tree Players, which had been using the Union Hall to mount productions since 1978, along with the Red Barn Committee, saw a different path. By 1982, the two organizations raised $105,000, which included a Canada Manpower grant, to renovate and refurbish the building and give it new life. Alberta Premier Peter Lougheed re-opened the Union Hall on July 1, 1983 as a community centre. This renovation changed the original roof line. The Town of Canmore bought the Union Hall in 1994 and since then, the building has seen interior renovations, including a $90,000 kitchen renovation in 2006 completed in 30 days with all costs covered by grants, donations and volunteer labor. The main entrance stairs were replaced in 2008 similar to the original 1913 design. The window replacement in 2009 was close to the look of a 1926 photograph. In 2010 a complete washroom renovation was done by the Town of Canmore when mold was discovered. Given the extensive renovation work inside the Union Hall, the next logical step was to restore the exterior of the building, taking it back to how it appeared in 1913 after Canmore’s coal miners completed their work building what is today one of our community’s most important historical resources.